Mega Man fans rejoice! 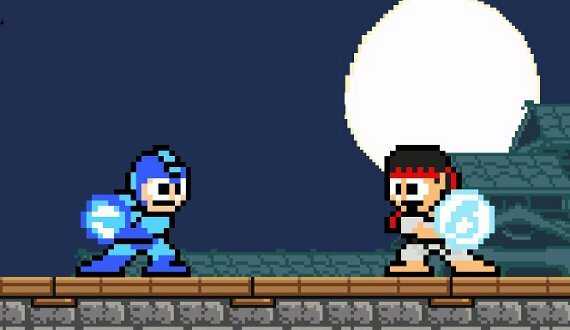 The Blue Bomber is returning in his 8-bit glory to take on characters from the Street Fighter universe. Street Fighter X Mega Man is a celebration of both franchises’ 25th anniversaries. That said, it’s definitely catered toward the Mega Man fan-base who’ve been begging for a new entry in the series. The game is pitched as a classic, 8-bit Mega Man adventure with Street Fighter characters as bosses. Based on the reveal trailer the game looks great, but judge for yourself below. I was a fan of Mega Man 9 & 10, which were released as console downloads and returned to the 8-bit style of the first five games in the series. This game follows the same path and seems to pull the same nostalgia strings effectively. Street Fighter X Mega Man was initially developed as a fan project, but continued to grow as Zong Hui, the creator, received positive feedback. After much work, Zong was able to get a demo of his game into the hands of a Capcom executive. The rest is history. Since the project was officially greenlit earlier this year, Zong has been working on it full time, alongside Capcom. His story is inspiring and a perfect example of hard work and persistence paying off. For more information about the game, check out Kotaku’s interview with Zong Hui. Street Fighter X Mega Man will be available as a free PC download on December 17.